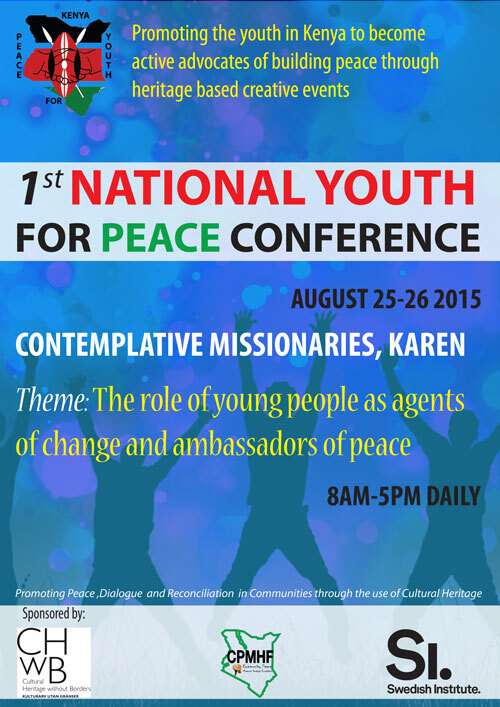 The first ever Youth for Peace conference will take place in Nairobi on August 25 & 26. Young people from across Kenya will gather to share their experiences and projects related to the role of youth in peacebuilding. Kenya is a hugely diverse country with many communities. It has a long tradition of using traditional objects to build peace and to encourage dialogue. Peace clubs are a growing phenomenon in Kenya and the Community Peace Museums and Heritage Foundation (CPMHF) is constantly working to support and deepen peace education. Kenya is a young country and the role of youth in this process is vital. With the support of the Swedish Institute’s Creative Force programme and in partnership with CHwB, CPMHF hard organized a celebration of creative peacebuilding through cultural heritage. The Youth for Peace project has been running since 2014 and many hundreds of young people have been involved.